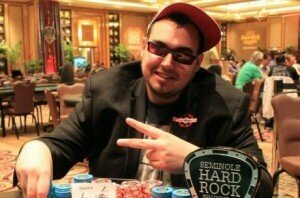 Seminole Hard Rock Poker Open is one of the competitions whose popularity is rising at an accelerated pace, due to the fact that many American players choose to participate. In the absence of a real alternative regarding online gambling, they have no choice but to sit down at the tables of live tournaments and this one is one of the most exciting. A brilliant combination of reasonable buy ins and an impressive field of players partially explains the success of the Seminole Hard Rock Poker Open. The most recent edition brought together a total of 2888 players and each of them paid $350 to participate in the opening event. The Deep Stack No Limit Hold’em competition was a huge hit with many players from neighboring states traveling to Florida, hoping to win a slice of the $866,000 price point. There were a couple of poker professionals who found it worthwhile to spend a couple of days competing here and this only raised the stakes for all participants. Danny Suied from Hallandale Florida and David Smith from New York quickly emerged as favorites to win the trophy, after greatly increasing the size of their stacks. They dominated the tables in the early hours and kept playing aggressive poker, further enhancing their dominance over the pack. By the time the final table was reached, they were in an excellent position of playing the heads up and the occasional bumps in the road didn’t slow them down. Things have changed in the last hour of play, with two more players coming strong from behind and by the time only four were left, things could’ve gone either way. In order to prevent luck from deciding the winner, the remaining players decided to split the money according to the size of their stacks. Danny Suied got the biggest share because he was the chip leader and he played the final hands without pressure, which proved to be the right thing to do as he ended up winning the tournament. This entry was posted in Poker News by admin. Bookmark the permalink.